DELISLE - Carte d'Asie Dressée pour l'instruction. . .
DELISLE, G . / BUACHE, Ph. / DEZAUCHE, J. - Carte d'Asie Dressée pour l'instruction. . .
Carte d'Asie Dressée pour l'instruction. . . - DELISLE, G . / BUACHE, Ph. / DEZAUCHE, J. 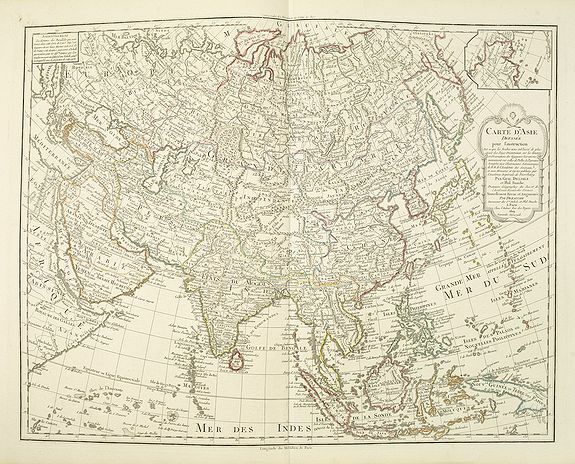 Title : Carte d'Asie Dressée pour l'instruction. . ..
Map maker : DELISLE, G . / BUACHE, Ph. / DEZAUCHE, J.. Date : Paris, J.Dezauche, 1819. Size : 19.5 x 25.0 inches. / 49.5 x 63.5 cm. Description :The map is a rare updated version of the Delisle-Buache map of 1762. Detailed map of Asia with inset map of Siberia but now the east coast of America with the "Nord-Ouest" passage deleted. Buache engraved a new plate for this map. The map is of interest for the use of East Sea, the sea between Korea and Japan, here called "Mer de Corée ou du Japon.". Interestingly in his 1762 edition he uses "Mer de Corée". Buache based his map 1762 edition on the important 1723 map by G.de L'Isle, however Buache separates here the legendary "Isle de Jeso" from the mainland by "Dét.de Tessoi". Now in this 1819 edition he completely reworks the region and the island is called "I.Chicha ou Jesso" and he ads "I.Tchoka ou Sagalien" in much more detail. Also he incorporates the Strait of Tartary, which was discovered in 1809 by a Japanese, Mamiya Rinzo. The Russian navigator Nevelskoi in 1849 definitively established the existence and navigability of this strait . Condition : A very good copy.